Home › Advocacy › Good advice. Nice design (?). Doesn’t work. Good advice. Nice design (?). Doesn’t work. Lock the frame and both wheels to the stand. That is what the sticker says. It is good advice. No doubt about that. You don’t want to come back and find that you are missing a wheel or two. On the sticker, the silhouette helpfully shows where to fit your two chains or locks to keep your bike secure. Now have a look at this stand (on the right). See the nice “designer” semicircle of metal and the cut-out of a bike and the letter P? That’s to tell you that you can park your bike here, I suppose. It must have looked so good in the catalogue when they were choosing the street furniture. 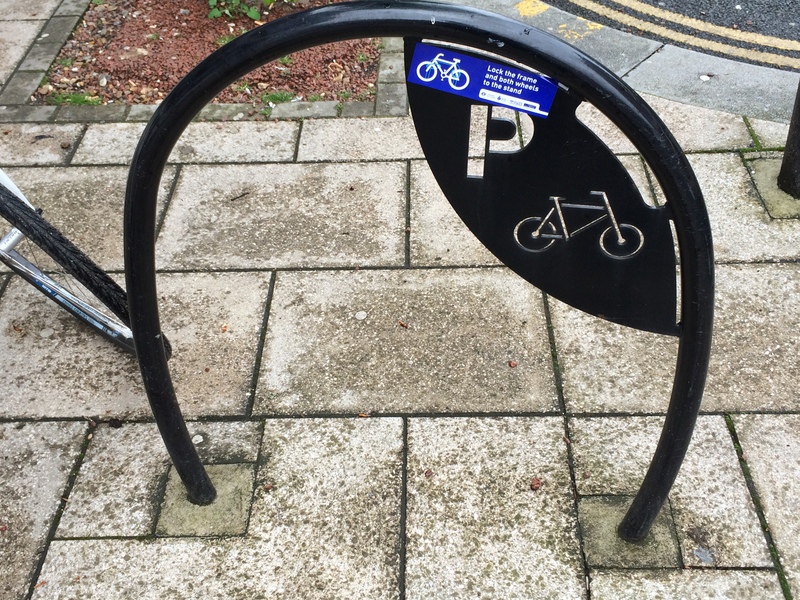 The trouble is that with that designer’s semicircle in place, it is more or less impossible to follow the advice and lock the frame and both wheels to the stand – and that is the very bike stand which the advice sticker is fixed to. The sticker comes from Transport for London. The bike stand is in the shopping area which was revamped under the Wallington Integrated Transport Package (was it in 2011? ), backed by… Transport for London. The London Borough of Sutton papers which are still on line say they had local cyclists advising them too. 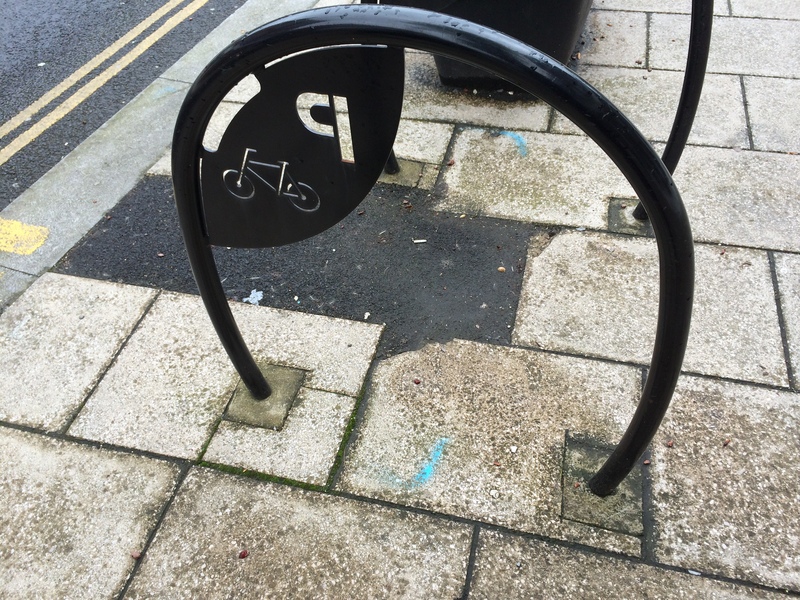 One of the features to aid cycling in that revamp was … improved bike parking. It is the one that always gets thrown in when there is new development and a need to appear positive to cycling. It is so easy to provide and then tick the box. As this example shows, it does not require much thought. Shame it does not work.